Your organization probably already uses Outlook. Now with Out’n About – your time sheets can be more accurate and more convenient. 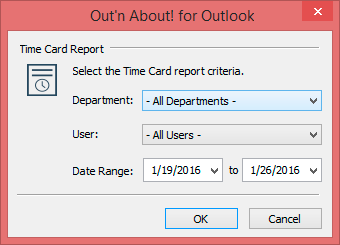 Time card reporting is built right into Out’n About for Outlook. As a manager, you’ll be able to run the reports you need to properly track your employee’s hours. Easily grab reports dating back to 30 days (more retention days coming soon). Out’n About is powerful software that can make your office life easier. At a glance, you can see your employee’s availability. An employee can run their own reports (limited to only their activity). Convenient because the user won’t have to call HR, IT or anyone to know when they took their lunch! Schedule a quick demo of Out’n About! Quickly learn the most popular features of Out’n About! For Outlook. View history and view employee information. Out’n About! 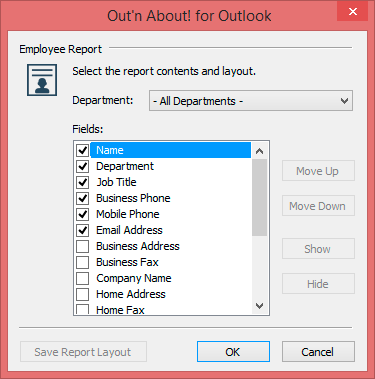 for Outlook includes Employee Reports. Pull any combination of available information fields and display them in a HTML table, easily copied to Excel. Out’n About! for Outlook tracks every check-in and check-out, in an easy to use report. 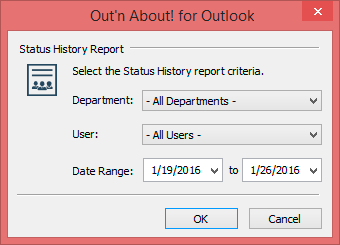 Control the date range, users, and filter by department.